Let’s face it. Holiday season = party season = eating and drinking ALL. THE. THINGS. Who doesn’t deal with this situation EVERY. SINGLE. YEAR?! We think that the holidays are a free for all, with the mindset that we’ll do a quick fix/detox/new year’s resolution…you get the point… to make up for our bad choices. But here’s the deal… we can make good choices and still enjoy the things that only come around during the holidays. So here we are, per usual, giving you some of our favorite tips to surviving the holidays while continuing to stick to our goals and enjoying all the season has to offer. Don’t starve yourself all day thinking you’ll eat all your calories at the party. Eat well-balanced small meals throughout the day and a light protein and fiber filled snack immediately before. This way, you can walk in without bee-lining towards the cookie platter. Do yourself a favor and also hydrate, hydrate, hydrate prior. Guess what? You don’t have to completely ignore all of the “bad” items. Grab a small plate, fill it with mostly fruits, raw veggies paired with hummus, and then you can save a small portion for your faves you look forward to all year. A good rule of thumb is to stick to the treats that you can’t get any other time of the year/at a grocery store - so if your Aunt Mary makes a mean generations long homemade cookie recipe, go ahead and enjoy and indulge...plus it fills her heart with happiness. Okay, so it wouldn’t be a party without the fun cocktails. So treat yo’self with ONE drink and then if you feel the need to have another beverage, switch to a less-sugary option like a vodka and sparkling water with cranberries. Be sure to get a glass of water in between your cocktails. When in doubt, bring your own dish. 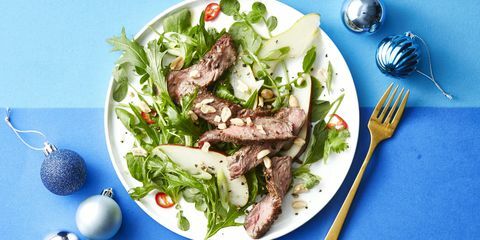 This is a two-fold win, the host will appreciate the offer and you’ll know you have a healthy alternative to the unknown calorie-rich dishes. Walk around and engage in the spirit with friends and family. And whatever you do, do not take station around the buffet table. This can lead to mindless over-snacking. Plus, you’ll get in extra steps if you continue to move around the party. Speaking of movement, make sure you are sticking to your fitness regimen. Get in at least 3-5 days of intentional workouts during the holidays. This could be a class workout, sessions with your trainer, or just making sure to take a long walk downtown looking at the christmas lights with friends and family in town enjoying the season. It’s not just good for beauty, getting enough sleep helps regulate your hunger hormone levels, which keeps you feeling satiated and not overeating, and keeps the lbs from forming around your waistline. Don’t be a grinch, find a happy medium and enjoy the season with your loved ones. Happy holiday, fit society!